This, I am fairly sure, is a recording that will divide opinion. Some collectors will find a few of Tennstedt’s tempi distractingly broad and the overall interpretation too wilful. I must admit that there are a few instances, notably in the first movement, where Tennstedt teeters on the brink of excess. However, in the context of this riveting, compelling performance a few such instances can be overlooked. This performance was the second of two that Tennstedt gave in February 1989. The booklet contains a fascinating essay by Richard Morrison, who had attended the first of these performances – in other words, not the one here preserved. Morrison’s essay was written in 1990 after hearing this recording and what makes his views particularly interesting is that when he wrote his article there was no thought that this recording would ever be released commercially. In other words, he didn’t write it to promote the recording. In his article, with which I find myself largely in agreement, he says of this recording: “the sheer emotional charge that Tennstedt brought to each phrase was astonishing.” A Mahler performance by Tennstedt was always an intense experience, even those recorded under studio conditions, and this very intensity inspired understandable reservations among some Mahlerians. If, based on his studio cycle for EMI, you’re allergic to Tennstedt’s approach then this Resurrection Symphony performance is definitely not for you. I’ve always admired Tennstedt’s studio-based cycle but over the last few years concert performances of several of the symphonies – numbers 1, 5, 6, 7 and 8 – have been released, chiefly by BBC Legends and the LPO label and these have convinced me that Tennstedt’s finest work was done on the concert podium rather than in the studio. The timings above exclude the applause – nearly a minute’s worth – after the live performance. Incidentally, the LPO recording carries the first movement in isolation on the first CD so that those who wish to observe Mahler’s injunction that there should be a pause of at least five minutes after I can easily do so. As I’ll discuss later, the tauter timing for IV in the new release seems to me to be wholly beneficial. The other thing that’s worthy of note is that there is a noticeable extra bite in the playing in the concert performance. Tony Duggan commented that the opening of I is “challenging, dramatic and biting”. That’s even more true in the new release. On the EMI disc the cellos and basses are sturdy and assertive but on the concert platform the playing is even weightier and more sharply defined while the tremolandi on the upper strings are even more exciting. It helps, I’m sure, that the recorded sound on this new release is excellent. The engineers working in the Royal Festival Hall have achieved splendid results. Not only does the recording report thrillingly Mahler’s many earth-shattering climaxes but also the quiet passages are captured beautifully. Just as one example of the engineer’s skill, sample the tremendous presence accorded to the soft gong strokes in I from 21:32 onwards. Indeed, the gongs are superbly caught throughout the performance at every dynamic level. It’s worth saying, before discussing the performance itself, that the recording comes to us courtesy of Music Preserved – formerly the Music Performance Research Centre. Jon Tolansky, the organisation’s co-founder, contributes a short booklet note explaining how the recording came to be made. We owe him and his colleagues a huge debt of gratitude, not just for making such a fine recording in the first place but also for negotiating what must have been significant contractual complexities to enable the commercial release of this recording. I hope many more of Music Preserved’s recordings will find their way onto commercial CDs. What of this present performance? In a word, it’s immense. Tennstedt conveys the huge sweep of the symphony yet the attention to detail is copious and in all this he’s backed every step of the way by committed, responsive playing from the LPO. It’s the first movement that may be most controversial for several times Tennstedt slows the music down to the limit of acceptability – some will say beyond that limit. The first such instance comes at 2:52, where the tempo is as broad as I’ve ever heard it at this point. But Tennstedt gets away with it, partly through interpretative concentration and partly because the LPO strings sustain the line beautifully. A few minutes later the passage between 7:04 and 9:25 is, if anything, even broader and hereabouts Tennstedt comes perilously close to straining my loyalty because the conception is, perhaps, broader than the music can take. But shortly thereafter, he whips up the pace dramatically and the music-making has a ferocious energy. Yes, the listener’s loyalty is tested by some of the extremes of tempo but Tennstedt has an uncanny knack of persuading you to stay with him – and it’s worth it. At 18:36 there’s another very expansive episode but here the calm radiance that he brings out in the music is ample reward. The last three minutes or so of the movement are managed superbly; there’s an inexorable tread up to the last brief climax and back from that moment and then comes the despairing downward plunge to the final, exhausted and isolated notes of the movement. Just for comparison I took down a few other live recordings from my shelves, all of which I admire greatly in their different ways. In Haitink’s recent Chicago account (review) the first movement lasts 21:12. Abbado’s Lucerne performance on DG (00289 477 5082) is quicker at 20:45 while Stokowski’s memorable LSO reading (see Tony Duggan’s survey) takes 20:59. Besides these, Tennstedt’s 25:02 looks unduly extended but the reading exerts its own magnetism. Usually, after the tension and high drama of I the second movement comes as something of a respite. I’m not sure that’s the case here. Tennstedt is quite steady at the outset and the phrases are carefully, though not excessively, moulded. Once again the LPO strings are on their collective mettle and the line is consistently well sustained. Frequently the music seems to wear a serious countenance; one such example is the passage between 10:02 and 10:54, which I don’t think I’ve previously heard rendered with such sad expressiveness. In III the sardonic wit of Mahler’s music is brought out successfully. The trio is quite spacious and warmly phrased. At 8:50 the anticipation of the finale is titanic. That passage is prepared quite superbly by Tennstedt – listen to the whooping horns! The table of comparative timings above shows that Tennstedt is somewhat quicker in IV than was the case in his studio recording. Frankly, despite the intensity that Tony Duggan rightly noted, I think the slow speed in the EMI recording was too much of a good thing. Just to give you an idea of the differences Doris Soffel’s first phrase on the EMI recording lasts an incredible 0:26 (the present performance is six seconds swifter). Later on, the oboe phrase before the soloist sings “Da kam ich auf einen breiten Weg” stretches the music to the ultimate degree of elasticity on the EMI recording but, at a slightly faster speed, it works much better here. Jard van Nes is a fine, expressive soloist, who sings with distinction. As the last strains of ‘Urlicht’ die away all hell breaks loose at the start of V. This movement is the musical equivalent of some of those large and detailed Renaissance paintings of the Last Judgement and Tennstedt realises Mahler’s great vision superbly. As was the case in I he’s not afraid to broaden the tempo – for example in the few minutes leading up to 5:50. The first appearance of the brass chorale (7:10) is softly sonorous and most impressive. At 10:33 the two huge percussion crescendi, the first daringly sustained, are thrilling precursors of the march section, which is taken pretty briskly. By the time Tennstedt has reached 13:05 the music has a nightmarish quality and he drives forward with frightening impetus to the brazen reappearance of the chorale on full brass. This passage culminates in a shattering, dissonant climax (14:16) as Mahler hurtles over the edge of the abyss. When the musical chaos that opened the movement is reprised at 16:45, a moment masterfully prepared by the conductor, it’s overwhelming; goodness knows what the impact must have been on the audience in the Festival Hall. After all this tumult the grosse Appell is superbly handled (18:48). The echoing brass calls are perfectly placed and the solo flautist is excellent. The first, almost imperceptible entry of the chorus – separately tracked – is a heart-stopping moment. The choir sings with hushed intensity and sustains that awestruck inwardness throughout this whole section of the movement. Yvonne Kenny’s first phrases – at “wird der dich rief dir geben” – are ravishingly beautiful. Another separate track is provided for the mezzo’s entry at “O glaube, mein Herz, o glaube” and once again Miss van Nes is extremely communicative. The male voices of the chorus make a fine impression in the section beginning at “Was erstanden ist”. Tennstedt builds the tension inexorably until the great outburst at “Aufersteh’n, ja aufersteh’n wirst du”, which is a moment of enormous emotional release that threatens to lift off the roof of the hall. From here on the Festival Hall organ reinforces the ensemble tellingly as Tennstedt guides the symphony to a massive, affirmative and genuinely thrilling final peroration. At the end the audience erupts, according the performers a tumultuous ovation. I had the sense that there was nothing contrived about this but, rather, that those present needed the emotional release. On CD the performance is thrilling but it must have been a once-in-a-lifetime experience for those in the hall. If you want a “safe” library choice for Mahler’s Second Symphony you should look elsewhere, for this is highly personal – and it’s significant that in the aforementioned article Richard Morrison expresses the view that this performance was quite different to the one by the same forces that he’d heard just a couple of nights earlier. This, then, was Tennstedt working in a white-hot interpretative crucible. The recording will be self-recommending to all admirers of this great conductor. It certainly puts his EMI recording in the shade and I suggest that, even though it’s a one-off, it’s probably a fairer representation of Tennstedt in this symphony than was his studio traversal, which sounds more inhibited by comparison. Even Mahlerians who are not Tennstedt admirers should try to hear this remarkably odyssey. They may not agree with everything they hear – indeed, I’m sure they won’t – but I hope they’ll still be stimulated afresh in their overall appreciation of Mahler’s most theatrical symphony, as I was, by experiencing Tennstedt’s remarkable vision. One final thought. 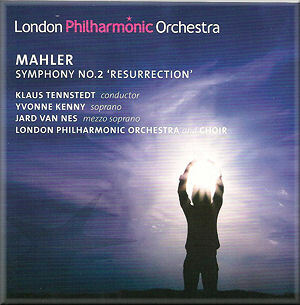 There are now live recordings – on EMI, on BBC Legends and on the LPO’s own label – of Tennstedt in the majority of Mahler’s symphonies, though the Eighth is available only as a DVD. We lack numbers 3, 4 and 9 and if concert performances of those symphonies exist it would be wonderful to have them issued on CD to complement this most exciting release.